Acres: 12,490, Franklin and Gulf Counties, FL. Other management: Conservation easements: 21 totaling 1,625 acres in 12 counties in Florida. Location: 22 miles southwest of Apalachicola, FL, boat needed to reach island. Undeveloped coastal barrier island with representative native plants and animals. Migratory bird stop-over, nesting bald eagles, nesting loggerhead sea turtles, red wolf island propagation site. Open water 264 acres, wetlands 4,566 acres, forest 5,861 acres, shrub 1,412 acres, sand dunes 387 acres. Current budget (FY 05) $559,500. 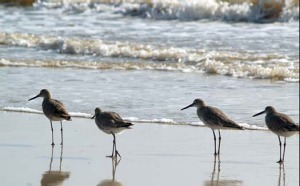 Provide habitat for migratory birds. Provide habitat and protection for threatened and endangered species such as American alligator, bald eagle, indigo snake, red wolf and sea turtle. 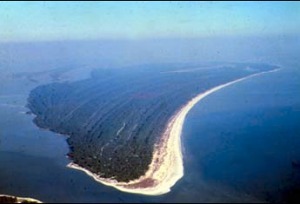 To manage and preserve the natural barrier island and associated native plant and animal communities. Provide wildlife-dependent recreation and environmental education for the public. 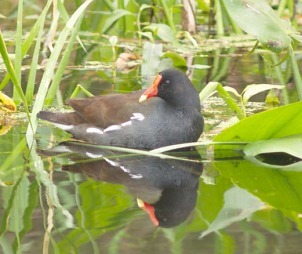 Water management for waterfowl, wood storks, wading birds, shorebirds and fish. Deer management with public hunting. 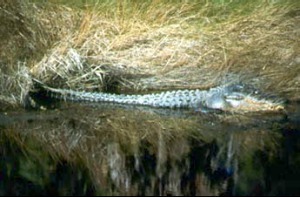 October: National Wildlife Refuge Week. November-January: Primitive weapons deer hunting. Can you drive to the refuge? No. 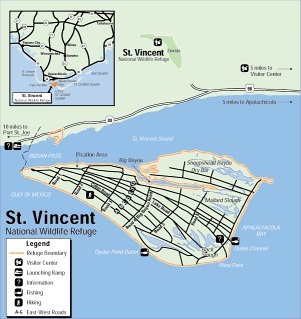 St. Vincent is a barrier island off the coast of Apalachicola, Florida. Do you need a boat to access St. Vincent? Yes. If you don’t have a boat, contact the Apalachicola Chamber of Commerce. They maintain a list of vendors who will take you to the refuge for a fee. Do you provide tours to St. Vincent? Yes. During National Wildlife Refuge Week, we have open house tours. When can we apply for the Sambar deer hunt? Brochures and applications are available in May. Where is your Visitor Center located? We are located in the John B. Meyer Harbor House, 479 Market Street, Apalachicola, FL. Hours 8:00 am-4:00 pm Monday-Friday.